Darrell Kunitomi gives his last tour of historic building as newspaper moves to El Segundo. 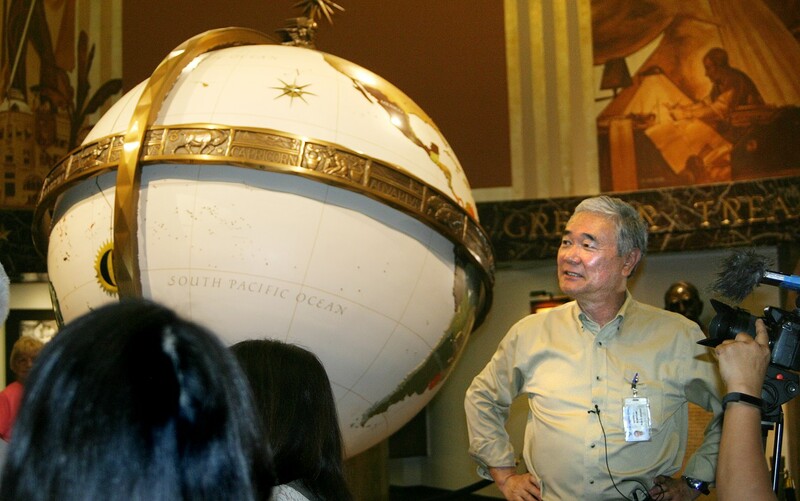 Darrell Kunitomi starts the tour in the L.A. Times lobby, which includes a large globe and murals dating back to the 1930s. July 3, 2018 is a date that will go down in history at The Los Angeles Times. Under new owner Dr. Patrick Soon-Shiong, a biotech billionaire who bought The Times from Tronc for $500 million, the newspaper is moving from Downtown L.A. to El Segundo. The newspaper no longer owns the current building, and the owner, Onni Group, wanted to increase the rent by $1 million a month. Kunitomi — also known as an actor and singer with the Grateful Crane Ensemble — started as a tour guide in 1977-78. He then worked in Circulation and Archives, helped create the lobby display, and returned as a tour guide in 1982, continuing for 36 years. The tour started in the lobby, which features a huge aluminum globe with bronze bas-reliefs at the base symbolizing industry, religion, science and art; 10-foot-high murals painted in 1935 by Hugo Ballin, who also painted the Griffith Observatory rotunda; and the historical exhibit covering The Times’ first 100 years. Kunitomi has memorized facts and figures as well as entertaining anecdotes about the newspaper’s storied past. But this tour was a little different; many of the prize-winning photos had been removed from the wall, and the staff were in the process of packing up their belongings. The presses used to be a staple of the tour, but they are now at a different location, 8th and Alameda. “We used to have presses at The Times, and it was exciting to go down at 2:25 p.m. to grab the Late Final fresh off the line, then run them upstairs with the closing New York stocks and latest news,” Kunitomi recalled. For Kunitomi, the most fascinating part of the stories he tells is how the newspaper and the Chandler family built the city. “Now, critics and naysayers would call union-busting, Republicanism and Nixon, the theft of the water from the Owens Valley, and my answer is: Los Angeles, my hometown, would never have become the great city it did without The Times and that family. And really, who am I to criticize? One of the most solemn parts of the tour is showing plaques dedicated to **Times** staffers who were killed in the line of duty: Tom Treanor, 1944, France; Ruben Salazar, 1970, East L.A.; Joe Alex Morris, Jr., 1979, Iran; and Dial Torgerson, 1983, Honduran border zone. On the lighter side, Kunitomi talks about notable columnists, critics, cartoonists, photographers and reporters he has hung out with, including Jack Smith, Charles Champlin, Art Seidenbaum, Paul Conrad, David Shaw, Dan Sullivan, Sylvie Drake, Robert Hilburn, Steve Lopez, Chris Erskine, Patt Morrison and Robin Abcarian. 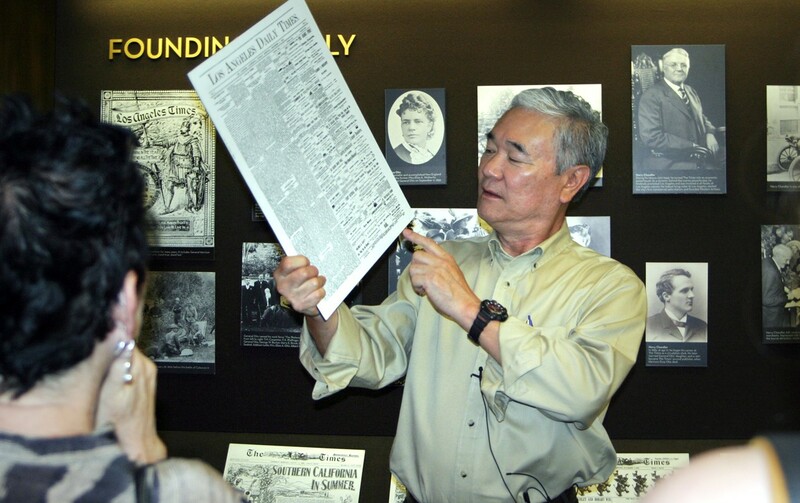 With a display about the Chandler family as a backdrop, Darrell Kunitomi shows replicas of the newspaper as it appeared more than a century ago. Although The Times supported the roundup, Kunitomi doesn’t go out of his way to criticize the paper. “Who didn’t favor internment? … 2018 hindsight is perfect. We have to be careful when examining history because we are not of those times. It was a fearful, patriotic and popular war, with only one senator voting against the war. Only two papers I know of editorialized against the removal. Only the Quakers helped us. It seemed the entire nation felt imprisonment was correct. The hate was high, we were at war, a lot of Americans had died. And we were ‘the ones who did it.’ That was the general feeling of that era. “We didn’t know that Japan could not reach the West Coast, that the Pearl Harbor attack was a gamble that succeeded … Life [magazine]had to show Americans ‘the differences between Japanese and Chinese.’ Few knew where Pearl Harbor was. We have to remember how unworldly the United States was in 1941: 40 percent of America was rural, illiteracy and childhood illnesses were common. My dad spoke of guys who got their first pair of shoes in the Army. The world was far, far different. “This is not a justification for internment. We have to know what was the atmosphere of the era to understand how the hate occurred and exploded, how movies, politicians and newspapers and radio fed all that patriotic fervor and resulting hate after Pearl Harbor, and how The Times was a part of the era. Part of a tour guide’s job is fielding questions, and sometimes the questions are less than friendly. “I’ve lately had to address the ‘fake news’ phrase, and how it’s truly bankrupt of meaning. Some of my best times were talking with men — always men — who didn’t like The Times. I sometimes felt as if I were talking to a conservative Nisei uncle, weird as that may sound. “I’ve always thought that if someone isn’t frothing at the mouth in anger, they can be talked to. Then I could point out how The Times has indeed endorsed Republicans, gone independent, refused to endorse anyone. Gone left, gone right, gone down the middle, making both sides mad. “But I’ve also learned how one’s ethnicity, religion, domestic situation, sexual orientation or income level affects how you see information, history, and ‘the news.’ Take our community; if we JAs discuss the internment of WWII, most of us are on or near ‘the same page’ – it was unjustified, unconstitutional and a bad thing for America to do. Now, let’s pitch the words ‘American concentration camp’ at a Jewish person and watch what happens. In my own life I’ve done that, and glad to say my Jewish friends are still friends to me, because they didn’t like it one bit. 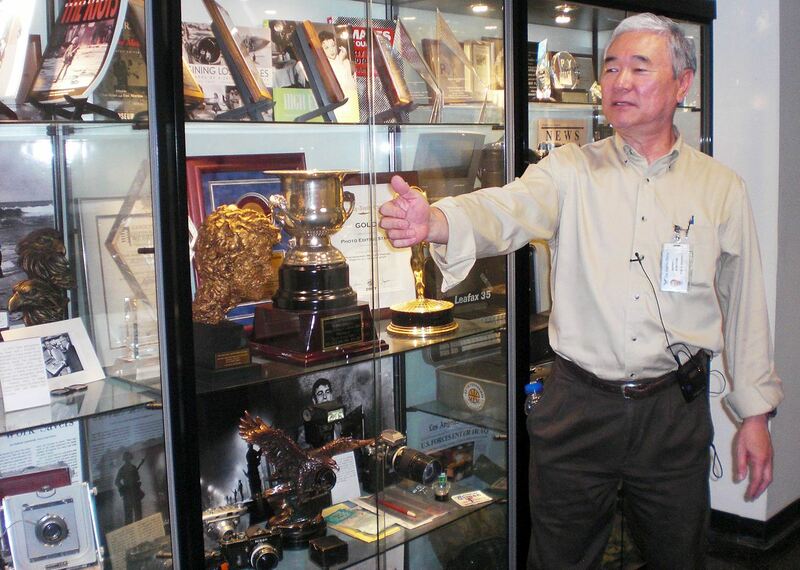 Darrell Kunitomi shows visitors a display case containing awards that The L.A. Times has won as well as photographic equipment used by the staff over the decades. And what are his thoughts as he leaves the old building? “It’s a terrible feeling, and I may be feeling it more than any of my 800 co-workers. The Globe Lobby contains the history of the region, from pre-Columbian contact though mid-century to today. And all parts thereof. I’ve grown up here. It’s been a 40-year journey with ins and outs, high times and low. But I’ve survived when my entire department has gone extinct — Public Affairs, the good will people. But Kunitomi’s career as a tour guide is far from over. “We’ll have tours in El Segundo … I’ll be creating one in the next month or so. A museum will be created. Dr. Patrick Soon-Shiong knows the history, and has promised a museum to showcase it at the new campus. “Most of what I do is meeting and greeting the public and giving tours. I may be the only official one left at an American newspaper; the other big papers stopped theirs years ago. I think that’s a big mistake – you cannot lose contact with the people, your customers, concerned Americans.